This popular set has (up until today) been one you had to write to us to get, well, now it is available here to download :) Includes cookies to decorate, decorations, a spatula, and a cookie sheet. A great way to keep little ones entertained while waiting for Christmas! Have you been looking at our adorable printable party kits and thinking, "those are great, but I do not have a party coming up"? Well, all of that cuteness is not reserved for just parties! The kits have many elements that could be fun any day! Coloring pages and paper-toys and dolls are perfect for play-time. Little boxes and bags make great carries for "just because"" gifts. Candy wrappers make any day a great day for something sweet, carry a few with you and practice random acts of sweetness! Banners can add cheerfulness as room decor and draped over a window they can make a gray day more colorful. Appetizer flags make cute oencil decorations, and thank you notes are good to have on hand because there are always things-to be grateful for. All of this and since you own a digital copy, you have the whole kit ready when you do have a party! This weekend our family decided to go on a little nature hike in the mountains and collect some pine cones to use for crafting. It was a beautiful fall day and the end result was an abundance of big beautiful pine cones that beckoned to be turned into something wonderful. 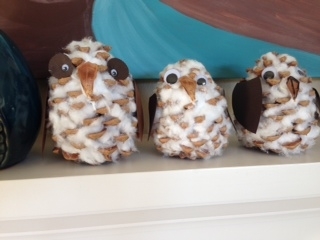 I think these adorable little owls fit the bill. I didn't have a chance to stop by the craft store so we used supplies that we had on hand already. I am sure with feathers, glitter, ribbons or felt you could add your own spin to these delightful creatures. Regardless, this is a fun and easy craft that the kids and myself enjoyed making very much. Separate cotton balls into small pieces. I found the smaller the pieces the better the look, and they were easier to work with. Next add drops of glue into the pine cone and onto the tips of each piece, then add cotton into all the little crevices. This will take a little bit of time to get it all stuffed with snowy cotton. After stuffing the pine cone to your desired fluffiness, add googley eyes, beak and wings with more glue. Yes, you will use lots of glue in this project! I broke a few bottom pieces from the pine cones to use for the beaks. I used a little sharpie on one of the beaks to make it stand out a little bit more too. You could also use small triangles of felt or construction paper. I used brown construction paper in the shape of teardrops for the wings. I think feathers for this would be so cute. You could even add some color! I think we may have to make a few more of these cuties for our Woodland Christmas Tree this year.